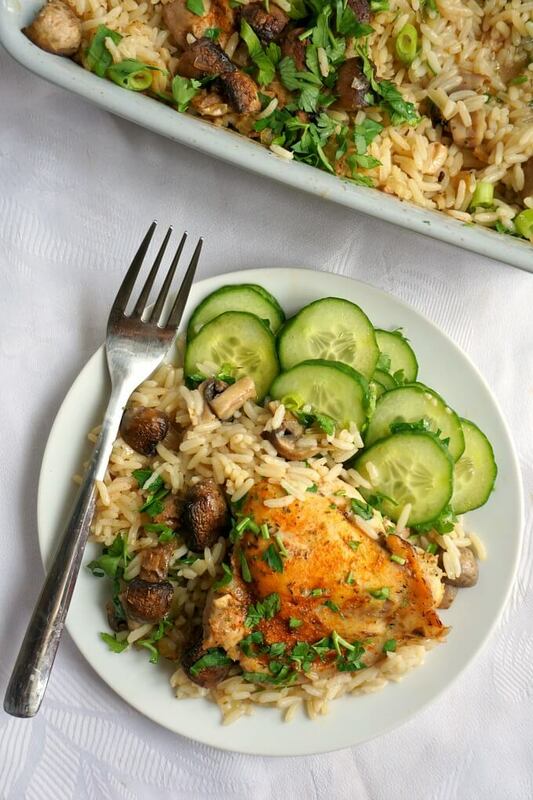 One-Pot Baked Chicken with Rice and Mushrooms and a refreshing cucumber salad on the side, a complete dinner recipe to be enjoyed by the whole family. Healthy, filling, gluten free, this dish is absolutely delicious. Inspired by Nagi’s famous Oven Baked Chicken and Rice, this is without a shadow of a doubt the meal of all meals, that will get everyone talking about. 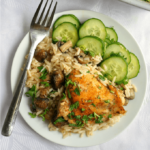 Perfectly cooked rice, super yummy chicken with a hint of garlic and paprika, and a touch of Italian herbs, plus some gorgeous mushrooms, all in one single dish. Even 6 month + babies can enjoy it without any problem, as long as regular chicken stock (broth) is swapped for no-salt chicken stock. I know babies don’t eat much, but with both my daughters I was a bit paranoid about the salt intake when they were under 1, so their meals had no added salt (or sugar) at all. Adapting a dish for everyone to enjoy is far easier and practical, no need to kill yourself cooking tons of separate meals. With my first daughter, being new to motherhood, I was forever worried what to cook for her, and I wasted precious time with baby purees that ended up on the floor. By the time I had my second girl, I was way more relaxed and wiser about food, and meal times have magically become fun and a nice time spent together. And surprise, surprise, little one is the best eater one can dream to have. No fussing over meals, she loves pretty much anything she is given. And this is the kind of dish that she loves, and happily feeds herself with her cute little hands. And even the big girl is now easier, and really loves this dinner. A big hit with everyone, hoorey! I have tried chicken with rice and mushrooms before, although that was cooked on the stove top. It does take longer to cook it in the oven, but the good thing about it is that you can just throw everything in there, and get on with something else, while dinner is getting ready. You can add any other vegetables too, peppers, courgettes, peas, carrots would work pretty well here too. Chicken thights can be replaced with chicken drumsticks, or whole chicken leg. SOME TIPS here about getting the rice perfecly cooked. Use the same cup you measure the rice to measure the chicken stock too, in this way you know you can’t get wrong with any amount. Rinsing the rice in cold water before adding it to the dish helps washing away some of the starch, so the rice is separated when cooked, and not mushy. If you use butter (although you can use oil only), just make sure the chicken does not have fat bits, otherwise the rice becomes greasy and heavy. Healthy chicken are rice recipes can be easier to make than you think. I chose to serve this dish with a lovely Asian-inspired cucumber salad, nothing fancy though, roughly sliced cucumber tossed in a soy sauce, sesame oil, rice vinegar and sesame seeds dressing. Easy, but super delicious, it gives that fresh touch to the dish. But you can serve it with any other salad, or vegetables. Or nothing else on the side, that’s not a problem, especially if you choose to add vegetables to the rice anyway. Cooking time can vary slightly depending on your oven, just I would just keep an eye on the dish from time to time, to make sure the chicken is thoughly cooked and the liquid has been absorbed. I cooked mine at 200 degrees C (392 F) for about 30 minutes covered with foil, and 35 to 40 without the foil. But again, the time can be approximate, you might need to leave it in the oven for a tad longer, although not too much longer. Enjoy this chicken and rice casserole, it’s one of a kind!!! 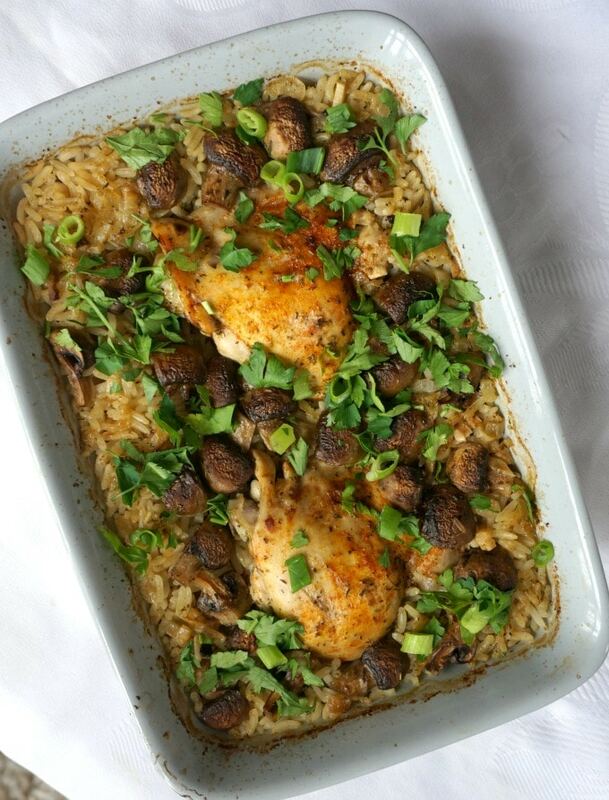 If you’ve tried my ONE-POT BAKED CHICKEN WITH RICE AND MUSHROOMS or any other recipe on the blog then don’t forget to rate the recipe and let me know how you got on in the comments below, I love hearing from you! You can also FOLLOW ME on FACEBOOK, and PINTEREST to see more delicious food and what I’m getting up to. 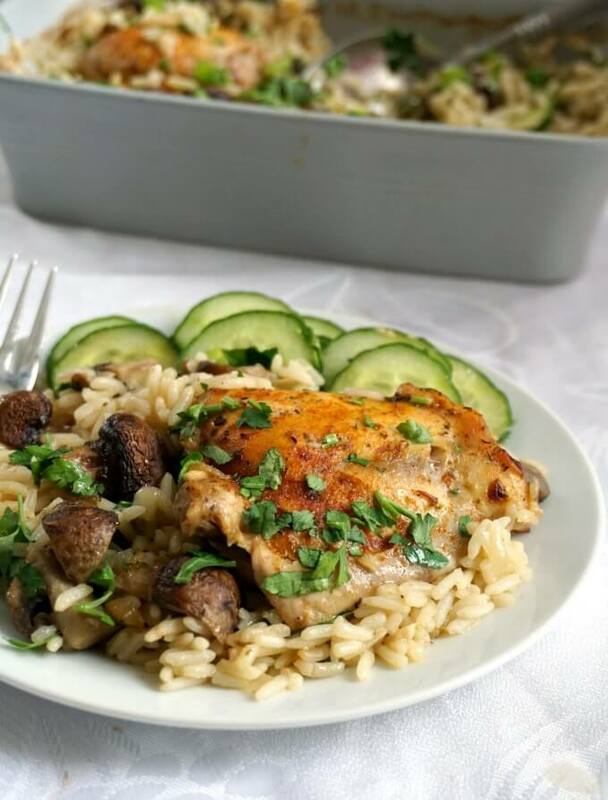 One-Pot Chicken with Rice and Mushrooms and a refreshing cucumber salad on the side, a complete dinner recipe to be enjoyed by the whole family. 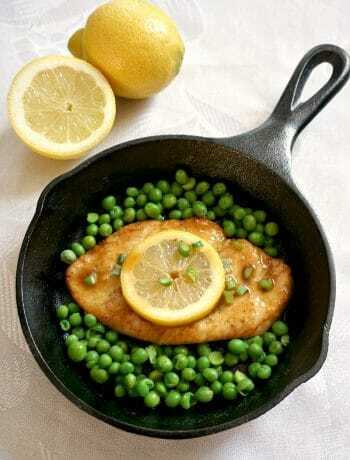 Healthy, filling, gluten free, this dish is absolutely delicious. Pre-heat the oven to 200 degrees Celsius (392 Fahrenheit). Peel and chop the onions and garlic, add the butter and oil to an oven-safe dish, and let them cook for about 15-20 minutes until soft, but not brown. Rinse the rice, and add it to the dish together with the chicken thighs and mushrooms, then pour the stock over and cover the dish with a kitchen foil. 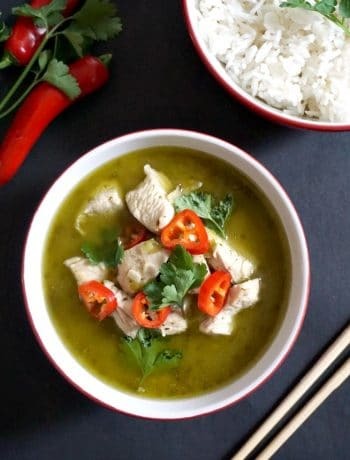 Bake for 30 minutes, then remove the oil and cook for a further 30 to 40 minutes, or until the chicken is cooked through, the rice is fluffy, and all the liquid has been absorbed. Garnish with parsley and spring onions. To make the cucumber salad, slice the cucumber finely, add the soy sauce, sesame oil and rice vinegar, and toss well. 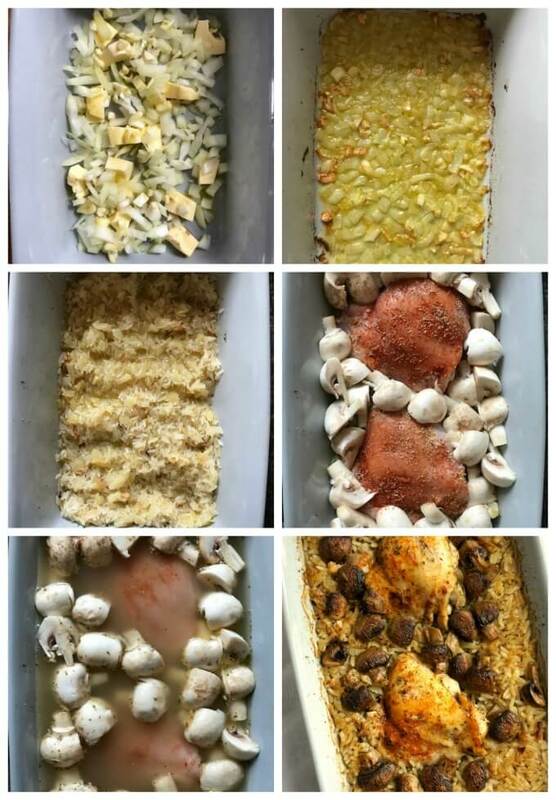 If you use a larger baking dish, you might be able to fit 2-3 more chicken thighs, depending on their size. I used large ones, so I could only fit two, but the rice should be more than enough for 2 large portions. Check the dish after 30 minutes without foil, depending on your oven, you might need to leave it for another 5-10 minutes if the liquid is not absorbed. You can add any other vegetables to the rice, carrots, peppers, peas work particularly well. Use no-salt or low-salt chicken stock (broth) if the meal is to be shared with little ones.